Welcome to “Antara’s Creativity” section. Diwali is around the corner & you all must be busy in preparations. Lightings, decorative Diyas, colorful rangolis, gifts, snacks & sweets all these make Diwali so special & cheerful. Festival of lights that brings happiness, prosperity & family together. To welcome goddess Lakshmi, every home is cleaned up & decorated beautifully with flower garlands, clay diyas, lighting lamps & candles. Market is full of all types of decorative items but Why to buy if you can make it at home. Yes you can easily make it at home that too with the easily available material. So friends, what better way to celebrate Diwali with homemade decorations. 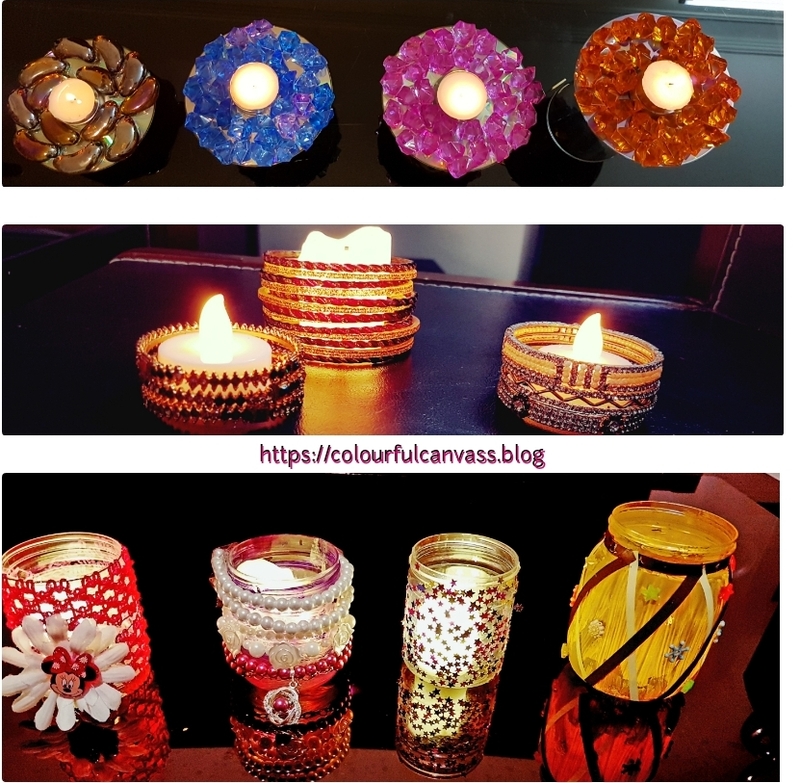 So in flow with Diwali enthusiasm, today we are telling you some very simple methods to make Candle holders. I had many empty pickle plastic jar & Nutella glass jar so we used them. 1-Let the colours of crystals dance with light. For this you just need old CDs, waste pearls/ colored pebbles/colored plastic crystal & glue. Here we used plastic crystals. Stick crystals on CD & for support you can use any old cups & glasses. 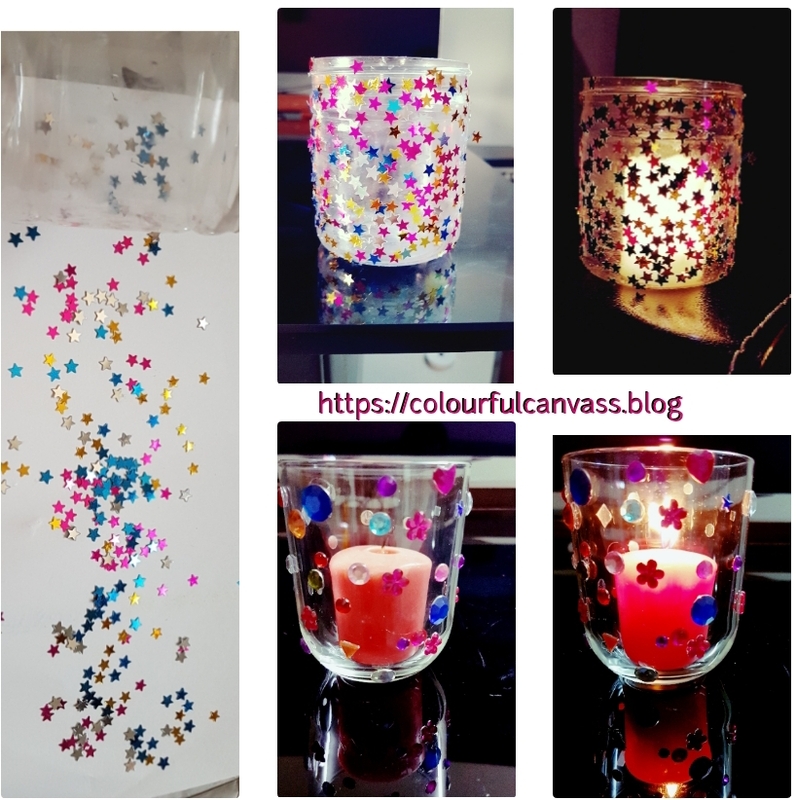 For this you need small plastic/thick glass jar, colorful glitter/sparkles.If you don’t have both just take coloured paper, finely cut into very small pieces. With the help of old brush, apply glue on outer side of the jar and spread glitters on paper evenly. Roll the jar slowly so that all glitters will stick it to it. Here Antara colored plastic jar fully. She tried to give look of clay mataka (earthen pot). Decorated with quilling paper & few decorative items . Here Antara used old necklaces, fancy rubber bands & one old hair band. You can use broad lace & bracelets too. Super easy method. Why not use shining bangles to spread light of joy. Just take few bangles & stick it to each other. Keep candle/diya in the center. I prefer LED candles most of the time, as these are safe and there is no need of proper attention. If you are using normal candles, always use thick glass with broad opening. Thanks for visiting & your kind support. 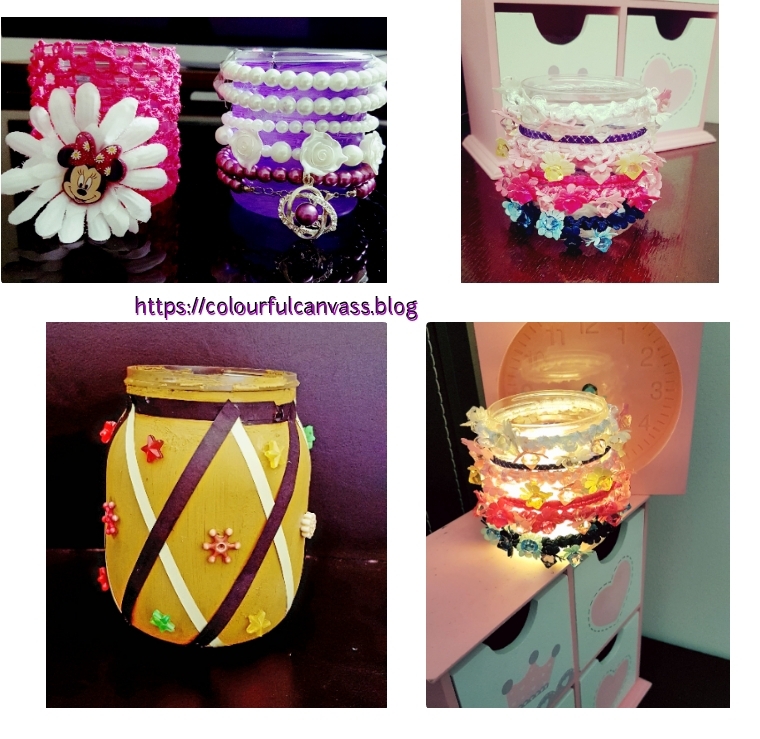 More DIYs for Diwali decorations are lined up so keep visiting. My next post is for Diwali lanterns coming soon. Previous Horror of first movie! 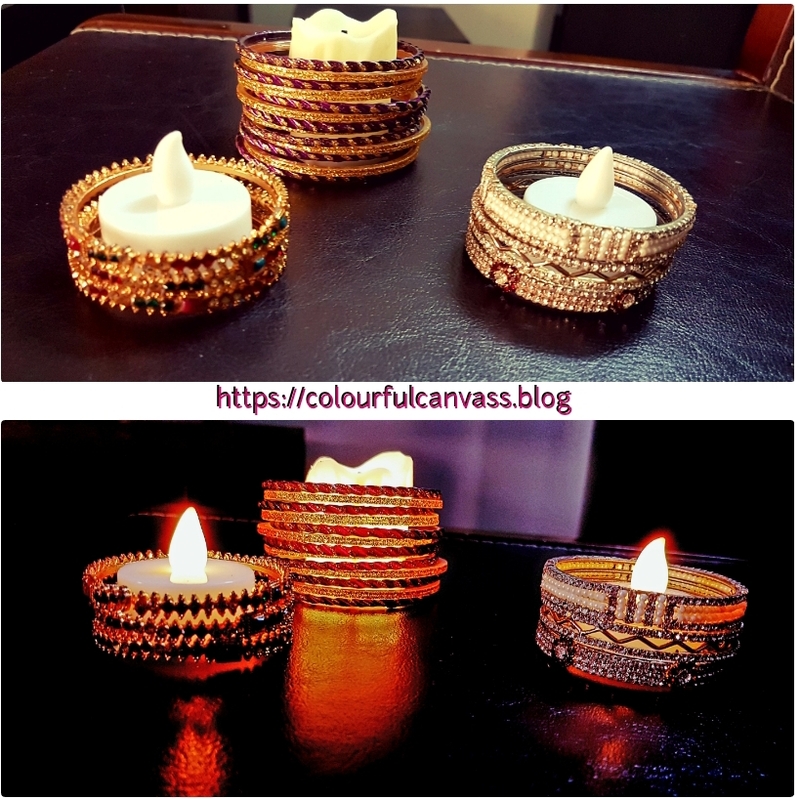 Yes Sadhana, bangles shine so nicely in candle light. So the Diwali has hit the wordpress! Welcome Dhanashree😍. So pleased you liked it. If u suggest me any ideas or suggestions on it for my room wall over bed . Beautiful..😍 I will definately try them. 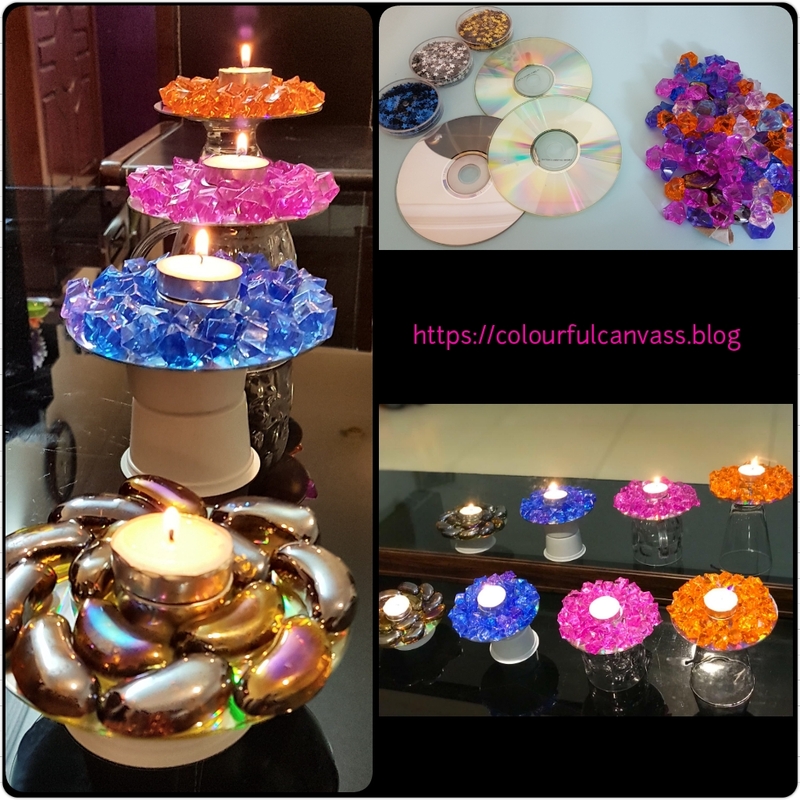 superb idea for making this diwali creative…. amazing. Thanks Tanupriya. Glad you liked it. That’s so sweet of you Akhila. Thanks ☄Diwali wishes to you too. What wonderful candle holders! Ankara is so talented, these are beautiful. Appreciate your feedback dear. Happy that you liked this work. Nice post. Such a amaizing ideas. Ooh I definitely want to try these, they look gorgeous! Thanks for posting! These are so beautiful and lovely ideas!! I’m definitely going to implement these ideas 🙂 awesome! you’re truly talented, gal!! Sure, try these ideas Sree. Thanks on behalf of my daughter Antara. As she is doing all this creativity stuff, I’m only presenting her work here.